Our Kid’s Discipleship Program is registering kids for the 2018-2019 discipleship year. 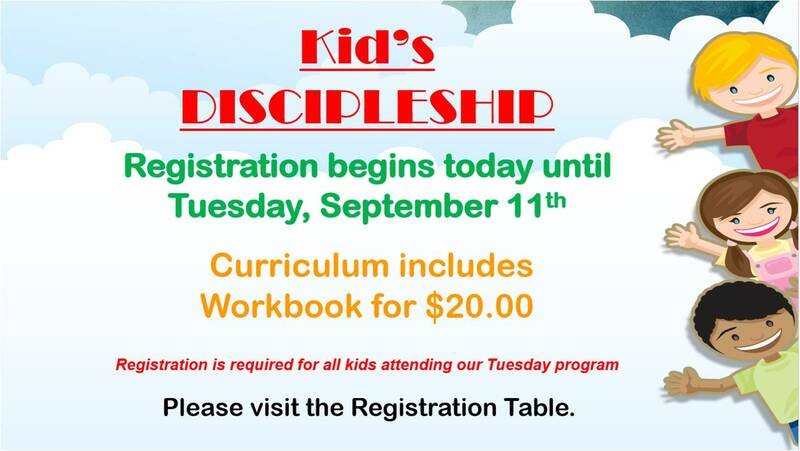 Our Tuesday night kid’s discipleship program is for children in grades PK-4 through 7th grade (ages 4-12). The cost for the student guide is $20.00 per child and t-shirts will be available for an additional cost. Registration begins today until Tuesday, September 11th and is required for all kids attending our Tuesday program. Please visit the Kid’s Discipleship registration table in the back.